I'm Noah Brown. 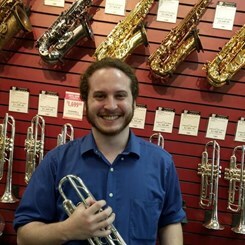 I've been playing trumpet since I was in 4th grade and ended up majoring in music performance at TCNJ. In my years studying music, I have played a variety of genres including classical and jazz. At TCNJ, I minored in percussion with a focus in keyboard percussion and timpani. I have been performing professionally for 5 years and have taught private lessons for 2 years.